It is always amusing to me when I come across a funny or misspelled message dialog in a computer application. Having worked on a desktop application at my previous job, I know that typos can slip into those dialogs, especially ones that are dynamically generated through various string concatenation, or ones that are hidden deep in the bowels of the code somewhere and only pop up on the rarest of occasions. That is why I think it is imperative (and really helpful!) to have a dedicated "resource" file or folder where all copy (messages, form labels, instructions, menus, etc) live. That way developers, QA, and even the product managers can proof-read the copy and make sure it is consistent. Example of a poorly worded dialog that I came across yesterday. Most of the image has been blurred to protect the privacy of my company, since I was doing work when this occurred. 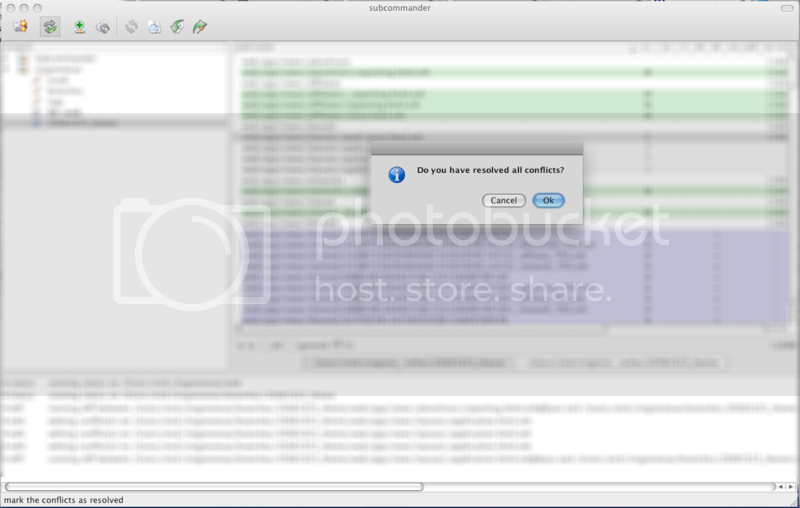 (Note: subcommander is an open source, cross platform client for SVN. It is capable of branching and merging, which makes it useful, but it has an awful user interface and is a bit buggy and slow currently. I'm hoping the UI gets a lot of love before this next version gets out of beta...otherwise they might be featured in my "bad UI" series a few more times.